Recreating the ubiquitous association between Longines and aviation that existed at the close of the 1920s requires a dash of H.G. Wells’ time travel and an active imagination, maybe even some psychotherapy. When psychologists use a word association test, they ask you to name the first word that comes to mind. For example, when I hear the word ocean, I think of the Caribbean. Common pairings, however, emerge when they are a part of the cultural lingo: hear Volkswagen/think Beetle; hear Babe Ruth/think home run; hear Caesar/think Rome – you get the idea. So what comes to mind when you hear Longines? Aviation? If so, some might think you need to get your head examined, but there was a time when Longines was the ready answer. When aviation emerged from its pioneering development (led by pilots Alberto Santos-Dumont and Louis Blériot) into its Golden Age between the two World Wars, flying became a household topic and Longines was aviation’s associated partner primarily due to one man: Charles Lindbergh. 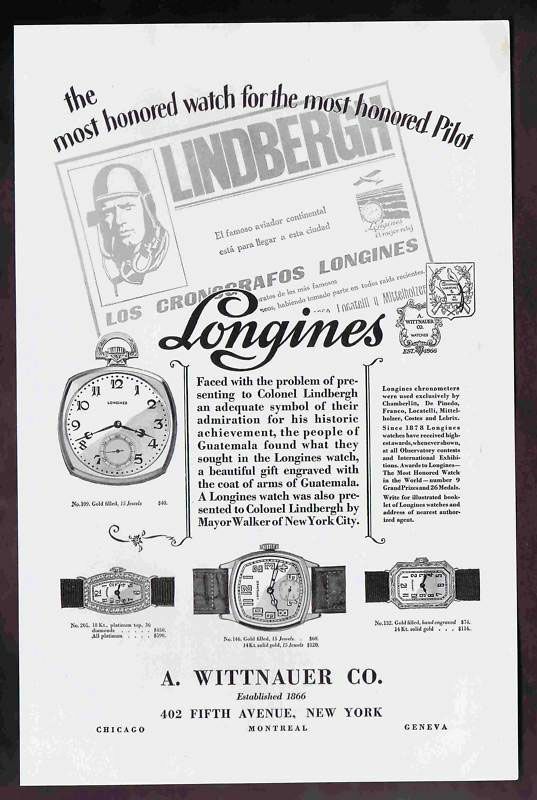 Famed Lindbergh, the media’s darling, and Longines would partner to design a navigational watch, the Hour Angle Watch. 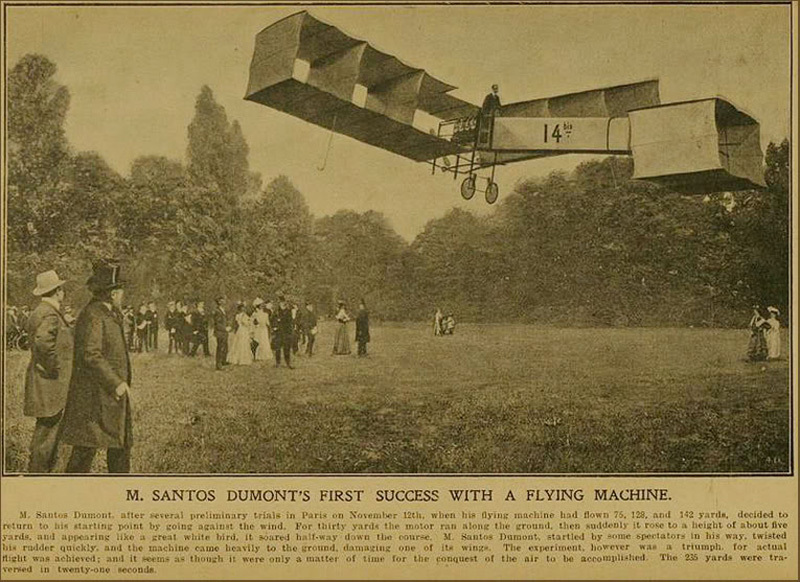 During this time between the wars, flying was no longer news; it was commonplace. Planes delivered the mail via Airmail, and the US Postal Service employed a bevy of pilots. 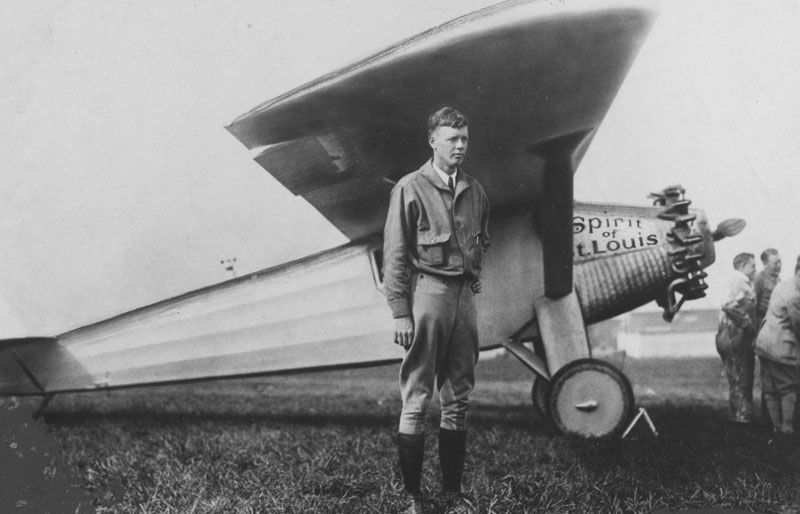 25-year old Lindbergh served as a US Mail Pilot, running the route between St. Louis and Chicago. Veterans became barnstormers, daredevil stunt pilots who toured the country, providing the first airshows and offering the public a ride. Crop dusting, aerial surveying and corporate aviation all came into being in the mid-1920s. The airplane was a part of the culture. 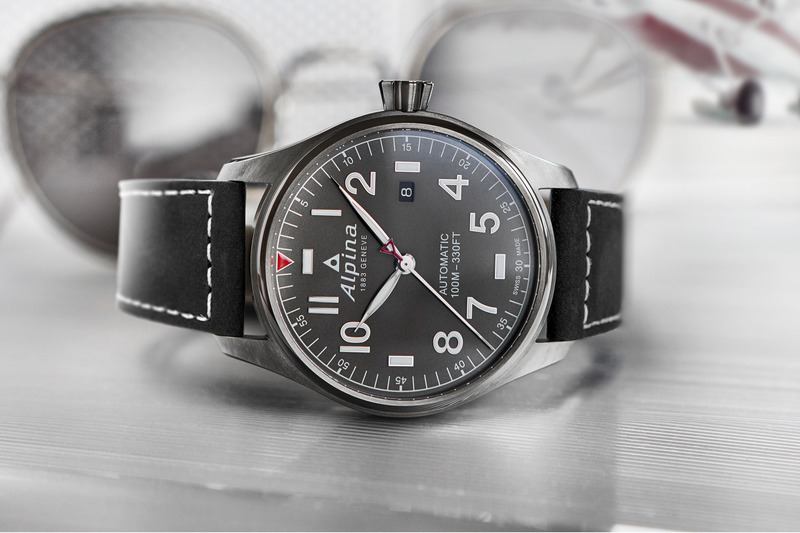 The rise of general aviation meant a growing need for navigational accuracy, which led to Longines’ horological advances. Being the official timer of the Olympics, Longines was a well-respected time keeper and a name that people knew. When Lindbergh flew his famed non-stop, solo Atlantic crossing, Longines timed the event; total time was 33 hours and 30 minutes. In 1927, Charles Lindbergh left Roosevelt Field in Long Island, NY and landed at Le Bourget Field in Paris, France to become an international sensation, a true celebrity. Even with the absence of paparazzi, 24-hr news and the internet, the media zoo descended on the Lindberghs and would later go into a frenzy with the kidnapping and murder of the Lindbergh baby, but for now, Charles Lindbergh was the celebrative man-of-the-hour. Not only did he do the seemingly impossible, but he united the continents, and life was never to be the same. For his accomplishment, Lindbergh won the $25,000 Orteig Prize, which had gone unclaimed since its initial 1919 offering and claimed the lives of several pilots with its allure. To accomplish the trans-Atlantic feat, he flew a Ryan NYP, which he helped design (a repetitive theme). This was a fabric covered, single seat, high-wing monoplane named the Spirit of St. Louis. Imagine flying all that way across the ocean and keeping your bearings. When I drive in unfamiliar areas, I use my GPS, and around town, there are plenty of landmarks. Over the ocean, there is water, sky and clouds; “water, water everywhere and not a drop to drink.” For ships as well as for planes, determining longitude at sea is the trick, and Longines would rise to the navigational challenge. 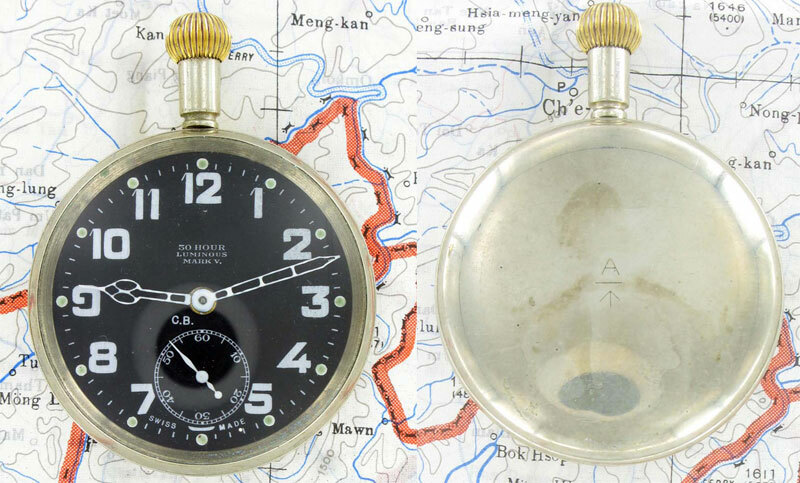 They produced a navigation watch that enabled calculating a precise location despite the accuracy shortcomings of the time. A few seconds off here or there, what’s the big deal? A discrepancy of a few seconds over time could mean a course deviation of several miles. How to compensate for the variance in time keeping and still maintain accuracy? 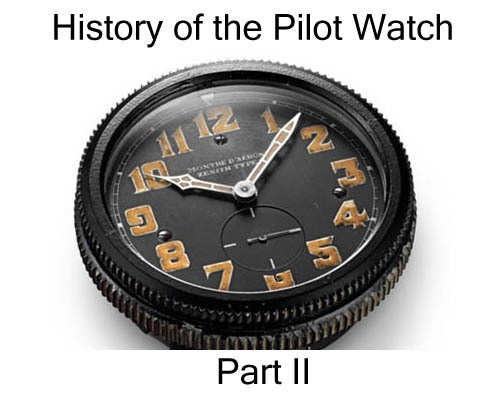 Before Lindbergh collaborated with Longines, there was P. V. H. Weems, and the less familiar Weems watch was the base model of the Lindbergh watch, essentially making Lindbergh’s an updated and improved Weems. The Lindbergh predecessor found a clever way to compensate for inaccuracy. 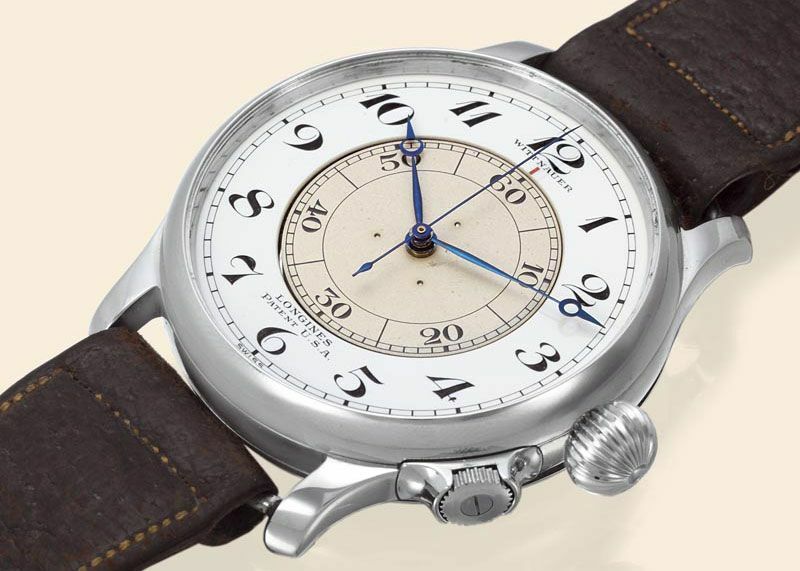 In 1929, Navy Captain Phillip Van Horn Weems in conjunction with Longines (and Wittnauer) developed the Weems Second-Setting Watch for nautical navigation. 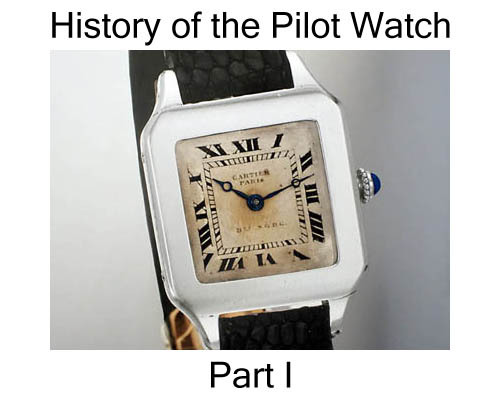 The watch also quickly became an aeronautical tool. Given the turbulent cockpits and the thick gloves needed for altitude flying, the Weems was typically oversized. This 48mm watch’s distinguishing characteristic was its rotating center seconds dial. Pilots could listen to the minute beeps over the radio and adjust the dial, which maintained accuracy. The rotating inner dial displayed the correct minutes and graphically showed the margin of error from the original set time. Lindbergh set out to update and improve the Weems watch based on his experience of flying over the Atlantic. He explained to Longines what he needed from a navigational watch, and the watchmakers went to work, with Charles Lindbergh giving his stamp of approval on the final product. 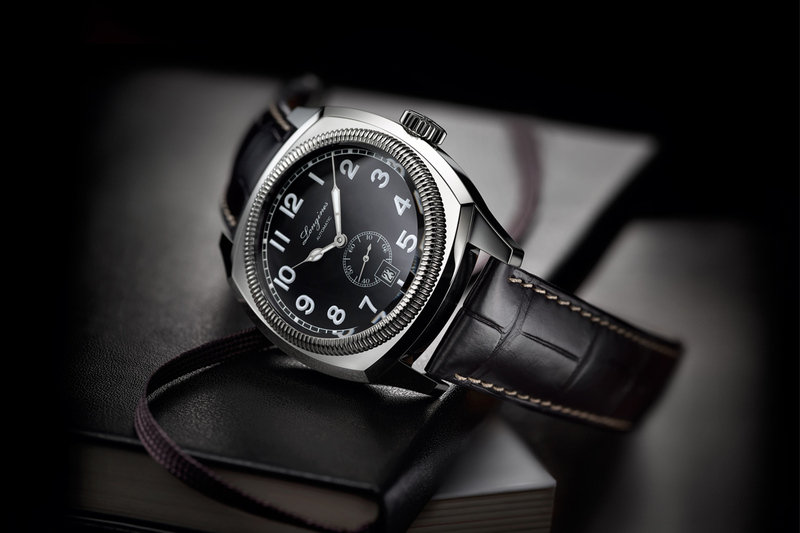 In 1931, the Lindbergh watch was born. If Mick Jagger or the Pope gave their endorsement of a watch, they might fall short of Lindbergh’s global notoriety; this was a huge PR boon for Longines, and they sold the watch to working pilots and the adoring public alike. 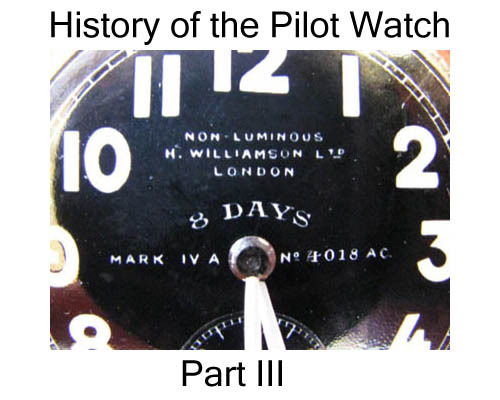 ￼The updated watch allowed pilots more easily to determine the Hour Angle, the watch’s namesake, which is a technical description of finding longitude based on then Greenwich Mean Time. 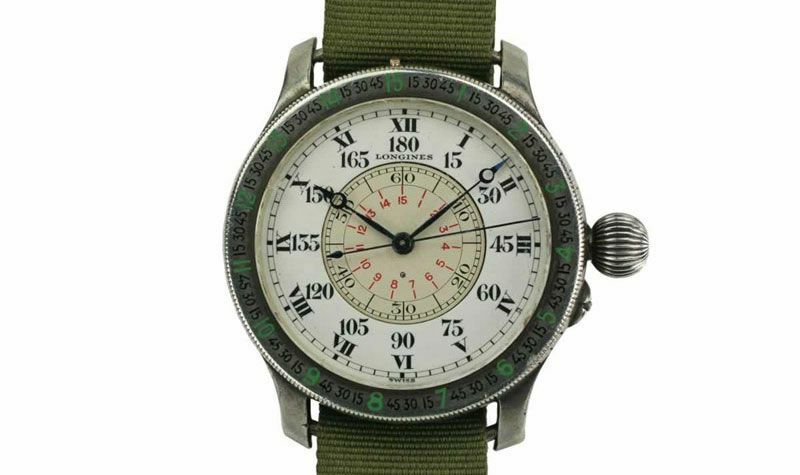 Lindbergh’s watch aided navigation with the addition of markings to dial and bezel that made the hour angle calculation easier. A pilot could now confidently determine his position even over miles of open water. 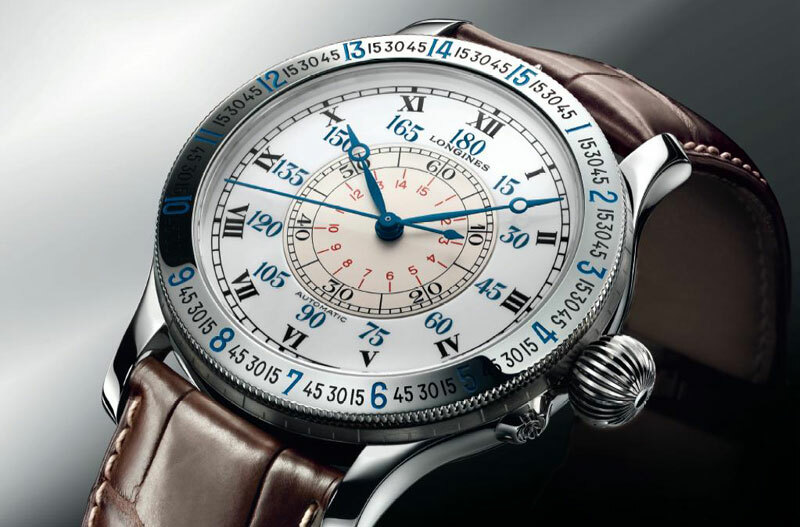 The remaining navigational challenge was to measure short intervals of distance, which is the subject of a subsequent article that explores Longines and Breitling’s development of the chronograph. Stay tuned. Meanwhile, compare these reissued watches below and their respective dials. ￼￼Commemorating Longines’ pioneering advances on land, air and sea, the company has reissued its famous models with its Heritage collection. 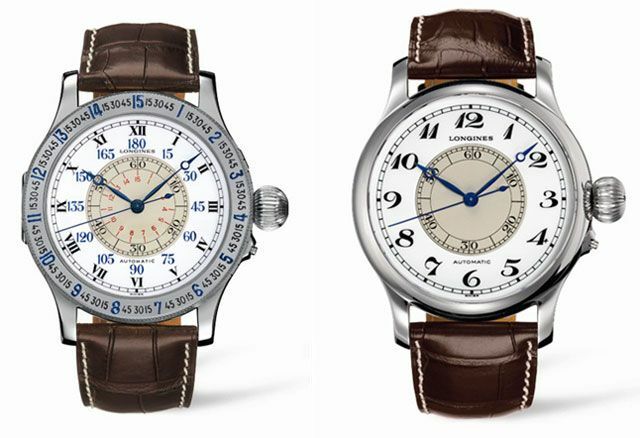 Both of these iconic watches are a part of this Longines retrospective. 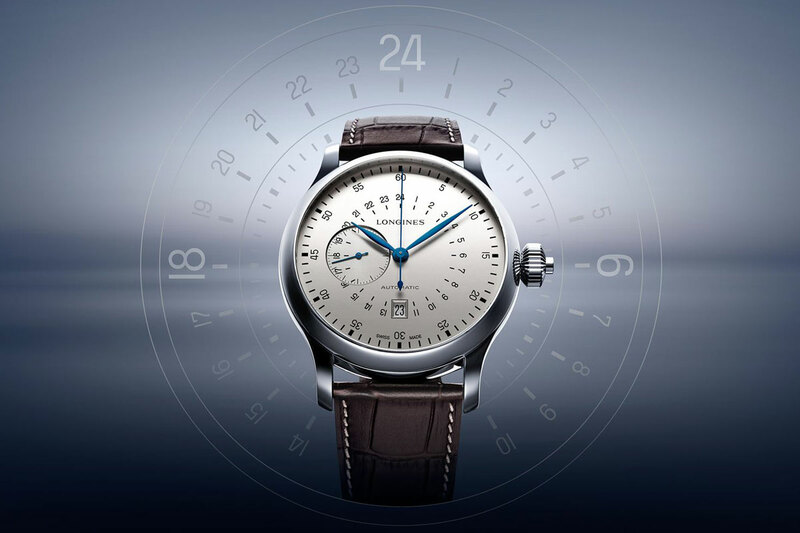 The entire collection can be found at the Longines website (click here). Though anachronistic in design and function, The Weems and Lindbergh watches’ real value is their historical achievement. In the Golden Age’s conquest of the skies, Longines was king. 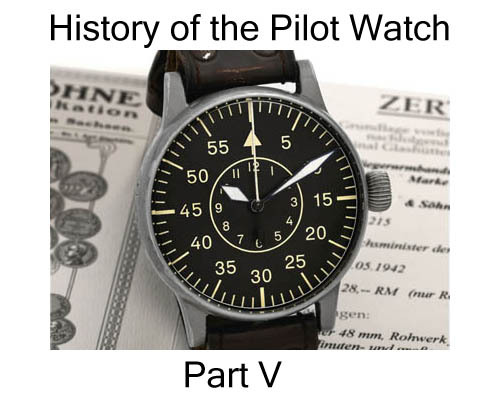 Check out History of the Pilot Watch Part I, II, III and V by clicking on the images below. I am looking for an original Lindbergh Longines watch (NOT commemorative issue) in 18 K gold. I will pay a finders fee.